Mazzei offers different options for clean in place needs. To find out which works best for your application, CONTACT A MAZZEI SALES ENGINEER. For inactivating E. coli and reducing the population of pathogens like Listeria monocytogenes by 99.99%, ozone is the proven solution. Cleaning containers and pipes with the power of ozone is easy and effective with a Mazzei ozone CIP skid. It uses the patented Mazzei GDT™ process in a compact, portable design. Mazzei aeration/air stripping skids clean tanks and pipelines in place for industrial drinking water inline applications. The skids can remove methane, hydrogen sulfide, carbon dioxide, and other volatile organic compounds from the water stream by injecting ozone or ambient air into it. 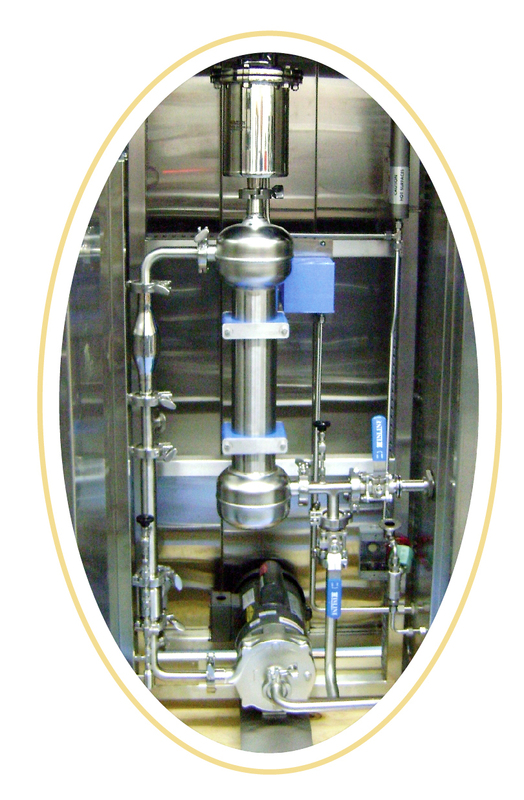 Air bubbles collect the dissolved gases on their surface and the patented Mazzei degas separator removes the entrained gases. Skid flows do not need to be pressurized because the injected flow is generated by a natural vacuum created by the patented Mazzei venturi injector. Disinfection begins with an application of detergent or surfactant followed by rinsing to remove organic debris as ozone will not disinfect dirty surfaces. Then the Mazzei GDT process is applied, effectively delivering the disinfecting power of ozone throughout the system. The process is performed at ambient temperature and excessive rinsing is not required.